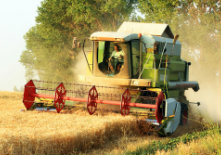 As farming practices change, so do your equipment needs. Keep your operation moving forward with our equipment loan — an affordable option for purchasing or upgrading your equipment. Our local lenders will work with you to establish terms that are suitable to your operation, and work to secure you the best rate possible. Keep your operation running smoothly, and apply today. These Farm Service Agency (FSA) guaranteed loan programs are used in central Illinois counties to offer a reduced rates of interest for beginning farmers and customers with tighter cash flows. Interest can be reduced by 4% for those who qualify, with loan limits per borrower. These loans are guaranteed by the federal government and therefore do not require a family guarantor or co-signer.